Comedy-horror movie Stree is all set to join the Rs 100 crore club where Hindi movies are concerned. 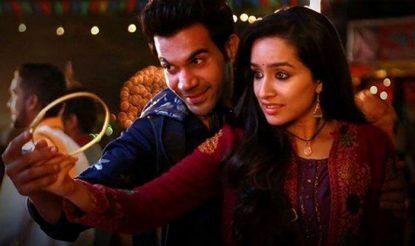 The movie, which features Shraddha Kapoor and Rajkummar Rao, was released on August 31, 2018. Directed by Amar Kaushik, the movie has been in theatres for two weeks now, and as per film critic Taran Adarsh, it is set to become the ninth Hindi movie to cross the Rs 100 crore mark. Stree, which was produced by Dinesh Vijan, Raj Nidimoru and Krishna D.K. under the banner of Maddock Films in association with D2RFilms, is based on an Indian urban legend about a witch who knocks on people’s doors at night. The witch is believed to be behind the mysterious disappearances of the men in the village. Adarsh also tweeted out the number of Hindi movies that have made it to the Rs 100 crore club this year. According to Box Office India, Stree is set to beat the business of Sonu Ke Titu Ki Sweety and Gold in a couple of days. “Then the Race will be on to see if it can reach the numbers of another sleeper SUPER HIT of the year Raazi. The difference from next is that bigger films like Batti Gul Meter Chalu and Sui Dhaaga will release which could slow the collections of Stree. Till date the film has been unaffected by the competition,” the report read. The collection of Stree in the first week was Rs 59,31,00,000, and by Friday it was Rs 2,00,00,000 approximately. By the weekend, it had touched Rs 97.67 crore.